First things first, marinate your pork by adding the soy, rice wine and cornflour and mix well. Set this aside while you prepare all the rest of the vegetables. Cook your noodles according to the packet’s instructions (if you’re using dried egg noodles, they normally don’t need more than 3-4 minutes to cook). When cooked, drain the noodles and set them aside. In a saucepan, heat the veg and sesame oil together before adding the onions and sautéing them for 2-3 minutes, until they’re just starting to turn brown. Add your carrots, minced garlic and ginger, stir well and then add you all the rest of your vegetables and fry for another 2-3 minutes. Pour the veg into a dish and set the same saucepan back on the hob. Add your minced pork and fry until brown – you shouldn’t need to add any more oil as the pork should release enough. When browned, add your vegetables back into the pot, mix well and add your fish sauce and sweet chilli sauce. The cabbage should start releasing its liquid but if you find it very dry, add 2-3 tablespoons of water if necessary. 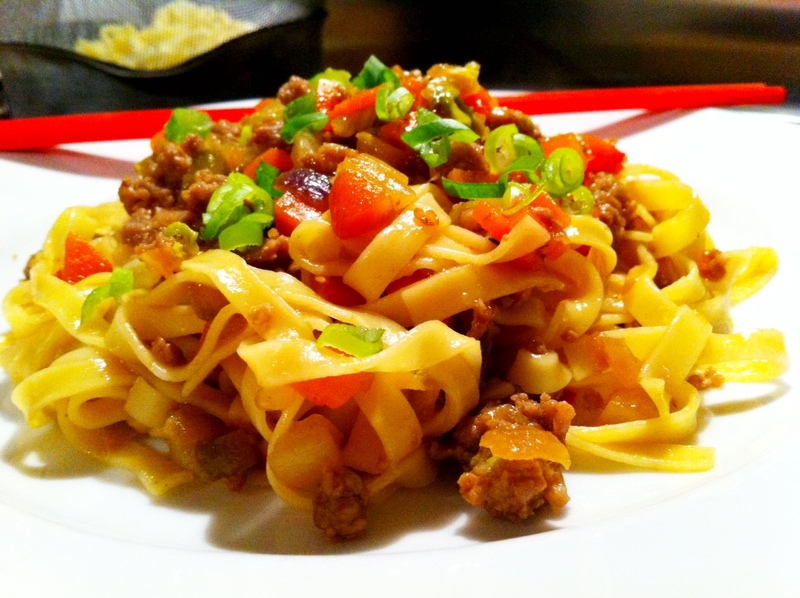 You can either pour the sauce on top of your noodles or add your noodles to the pan to mix through thoroughly. Garnish with the finely chopped spring onions or coriander.